The Dali Museum invites you to feast your eyes on 30 surreal works of wearable art created by teen designers, attire fitting for a Dali dinner party. The Dali’s Fashion Design program, sponsored by Neiman Marcus, invites high school students to learn the fundamentals of design, construction and runway presentation from experienced artists and designers. Drawing inspiration from Salvador Dali’s infamous dinner parties, budding Tampa Bay high school talent (grades 9-12) create tangible connections between art and fashion. The teen designers will also present their runway looks at The Dali Benefit Fashion Show, presented by Neiman Marcus. 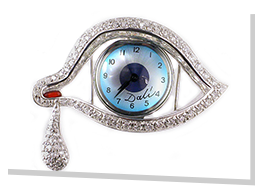 All proceeds benefit The Dali Museum’s Education Department. Learn more.